Since my house search took so darned long, my agent and I had the pleasure or viewing a massive number of places. Some were good, some were bad, and some were just plain scary. 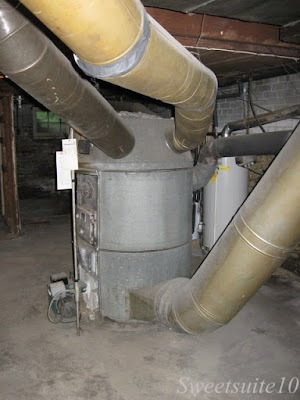 There was the place that smelled of cats, the house that had a leak in the roof (you could tell as there was water in the kitchen 2 floors below), and there were quite a few with octopus furnaces. Octopus furnaces, or gravity furnaces date from the late 1800's to early 1900's, and usually burned coal. The one above had been modified at some point to burn gas, but no matter the fuel they are not at all efficient. You can't see any in the picture above, but there was also asbestos wrapping on the ducts which would be a giant pain to have removed as it's highly toxic. We are purchasing a 1900 fixer upper with, what we are calling, "the Beast" in the basement. Yes, an octopus. This is our first time having to use such a thing and would like any help that can be offered and info on converting it to wood. Thank you! The only advice I will offer on this is consult a knowledgeable/licensed heating and Air conditioning representative regarding the possibility of any modifications to this outdated system.